Home / Home Improvement / How To Choose The Right Paving Material? Should You Consider Granite Paving Slabs? How To Choose The Right Paving Material? Should You Consider Granite Paving Slabs? Every one of us wants to beautify offices, homes and surroundings. If the surrounding is appealing and good, the house looks even more beautiful. The nicely paved road can enhance the beauty of the home by manifolds. Paving can fabulously shape an establishment and several bodies are involved in offering paving services like architectural, firms, builders and contractors. In fact, the use of stones is integral part of entire human civilization. 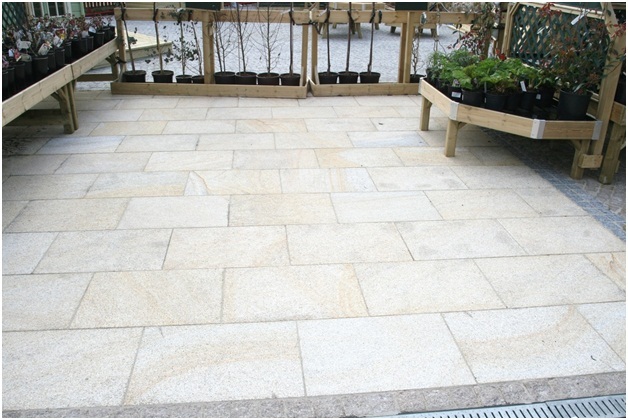 To add charm and value to your home, you may choose granite paving slabs. The material option is elegant, long lasting, beautiful for driveways and walkways. It is best meant for floor coverings used in the exteriors. The hardstone is durable and may be used for the exterior paving. From the point of view of architecture, the choice is durable. Why to choose granite paving slabs? Granite as paving material is flexible choice. Granite can be availed in various qualities and thus your paving can be medium priced or high priced. Granite can be availed in a variety of colors. You can choose bluestone which is a hardstone material. Bluestone is much better than sandstone or concrete but here you need diamond cutting blade. Granite offers two different textures among which choices can be made. You may choose flamed material or a normal one. Granite needs proper laying on the concrete slab with the help of mortar base. Being a robust material, granite ages gracefully. Firstly, you need you check the reputation of the company. Find out for how long the company is there in the business. Have a look at the insurance held by the company and the license. You need to choose a company which is bonded. This is going to protect you if the company does not deliver as per the expectation. You must interview the incharge of the company. Interview the company’s owner and the one who is going to do the paving. Enquire about the steps the company will take. Your choice of the right company depends on your gut and instinct. Check out the references to know how the company carries out its task. It will be good if you get the recent reference only. You may ask to what extent the customers liked the services, what pricing was charged for the same and other questions. This will give you an insight about how the company cares for its customers. By following the stated tips, you may choose the best company for granite paving slabs. Only when you choose the best company, you will get reliable services. Make sure your sideway, parking lot and walkways are maintained well. Choose only that company which has good reputation and solid track record.